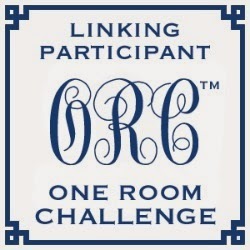 I’m so excited to be joining this round of the One Room Challenge! 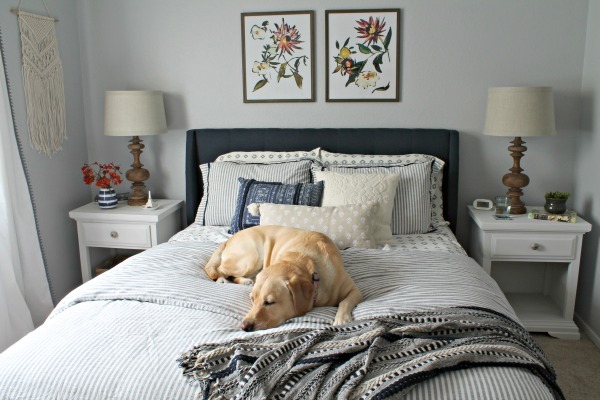 Basically you have six weeks to complete one room makeover – start to finish. We’ll link up our progress every Thursday until the final reveal on May 8th. You can read all of the details here. 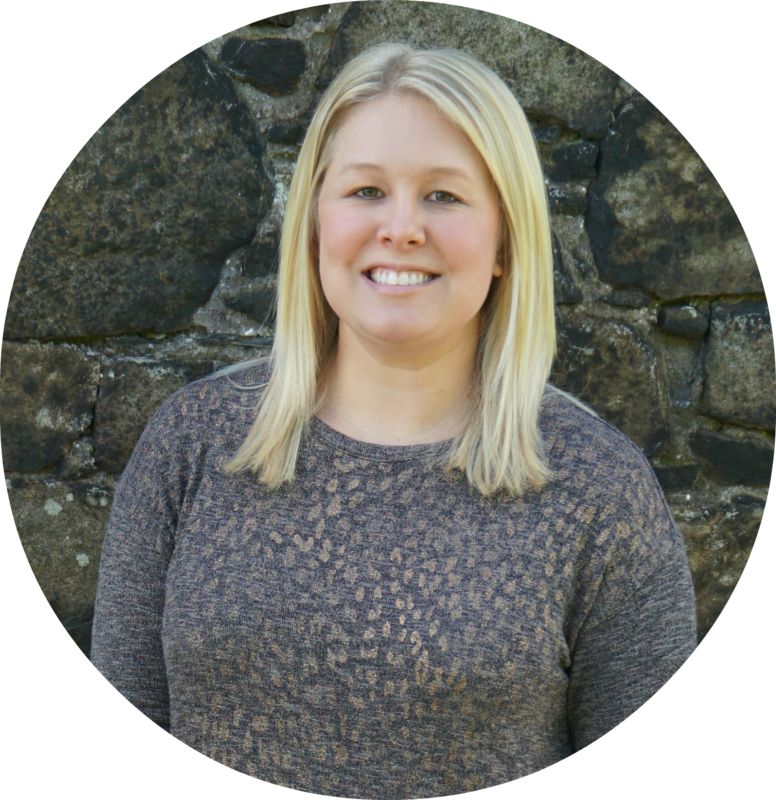 And don’t forget to stop by the link party to see all of the other bloggers participating! My laundry room is perfect for this challenge. It’s the only room in the house that hasn’t been painted yet. Actually, I haven’t done anything to the room except add a washer and dryer…and make a mess! 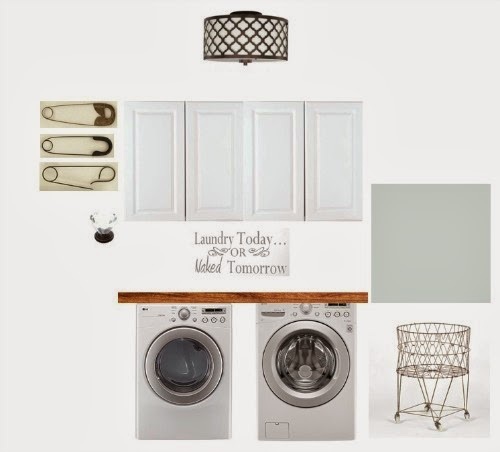 As with my last couple room makeovers, I put together a mood board to help myself focus on what I want the completed laundry room to look like. Source list at bottom of post. The first big project is going to be repairing the drywall. The previous owners cut a dog/cat door opening between the laundry room and garage and we’ve never fully repaired it. My boyfriend hung a new piece of drywall, but Ringo chewed through it as a puppy and we never fixed/finished patching the wall. Of course I’m planning to paint - I’m thinking a nice light blue color for the walls and fresh white on the trim. I’d like to replace the shelf with cabinets, but we’ll see…I also want to build a countertop across the top of the washer and dryer. The rest of the projects on my to-do are relatively small, so I think this is definitely doable! So fun! I love this link up idea and just might have to join! 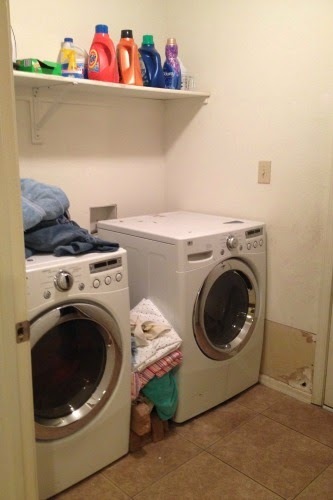 I can't wait to see your progress with your laundry room. I'm loving the mood board ideas. Oh how I wish I had a laundry room, and I'm sure I'll be even more envious when you're done. So glad you joined the challenge Sam!!! So excited to follow along, the mood board looks great! Hi Sam! I can't wait to see your finished laundry room. Love the inspiration board! Hi Sam, so nice to see you. I know you can rock this one. I love your plan. Glad you joined in. Your plan looks great! Love the art pieces! Good luck! loving your moodboard- esp the wood counter on top of the washer/dryer. how about adding a rod underneath the cabinets to hang 'non- dryer' clothes to dry? Great suggestion! There's actually a rod across the back wall that I use to hang my non-dryer clothes. I guess I should have taken a picture of that side too. Having a rod in the laundry room is the best! What a nice project! I love the ideas shown on your mood board. I've always wondered what your laundry room looked like! (It's not on your home tour ya see) and I like it! It sort of looks like mine did way back in the olden days. I like the idea of putting a counter surface. Warning: Make sure it is really well supported in the middle or it will start to rest on the machines, which is hard on the washer when it is doing spin cycles. We had to redo mine when we discovered that. I like it though! Can't wait!